Robert Clive, 1st Baron Clive of Plassey, KB (September 29, 1725 - November 22, 1774), also known as Clive of India, was the soldier of fortune and commander who established the military supremacy of the East India Company in Southern India and Bengal. He is widely regarded as a key figure in the establishment of British India and of the consolidation of British imperial ambition. For good or ill, Great Britain, not France, would rule India for the better part of the next two centuries. Clive's legacy impacted on the future of India, which the British regarded as the "jewel" in their imperial crown. Clive may not have set out to change history but the consequences of his victories in India brought Britain and India, East and West, into intimate and sustained contact. Although many British in India would look with disdain at the culture they encountered there, others developed a respect and an appreciation for India's cultural legacy that led to a mixing and mingling of ideas, philosophies, and world views. Arguably, India would impact as much on the West as the West would impact on India. Clive's legacy can be said to contribute, if indirectly, to the realization that to flourish, the East needs the West and the West needs the East or both are diminished by lack of cross-cultural exchange and mutual enrichment. Unlike others who followed him to India, Clive did not enrich himself at the expense of the conquered and colonized. 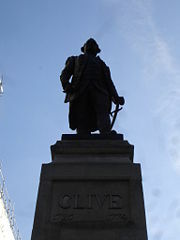 Statue to Clive in the market place in Shrewsbury town centre. Robert Clive was born at Styche, the family estate, in the parish in Moreton Say, Market Drayton, Shropshire. He was educated at Merchant Taylors' School in London. From his second speech in the House of Commons in 1773, it is known that the estate yielded only £500 a year. To supplement this income, his father practiced law. The Clives, or Clyves, were one of the oldest families in the county of Shropshire. They held the manor of that name in the reign of Henry II. Members of the family include an Irish chancellor of the exchequer under Henry VIII, a member of the Long Parliament. Robert's father for many years represented Montgomeryshire in parliament. His mother was the daughter of Nathaniel Gaskell of Manchester. Robert was their eldest son. He had five younger sisters and a brother. Teachers despaired of the young Clive. He was sent from school to school, and stayed for a short time at the Merchant Taylors' School. For all his neglect of studies, he did develop a clear and vigorous writing style which marked all his dispatches, and made Lord Chatham declare that one of his speeches in the House of Commons was the most eloquent he had ever heard. By the mid-eighteenth century, the Mughal Empire had become divided into a number of successor states. For the forty years since the death of the Emperor Aurangzeb in 1707, the power of the Emperor had gradually fallen into the hands of his provincial viceroys, or subahdars. The three most powerful were the Nizam of the Deccan (Asaf Jah), of south and central India, who ruled from Hyderabad, the Nawab of Bengal (Murshid Quli Khan), whose capital was Murshidabad, and the Nawab or wazir of Oudh (Sa'adat Ali Khan, Burhan ul-Mulk). The European Trading companies still acknowledged the sovereignty of the Emperor at Delhi, but their relations with these regional rulers were of much greater importance. In addition the relationship between the Europeans was influenced by a series of wars and treaties on mainland Europe. Since the late seventeenth century, the European merchants had raised bodies of troops to protect their commercial interests and latterly to influence local politics to their advantage. Military power was rapidly becoming as important as commercial acumen in securing India's valuable trade, and increasingly it was also the means of securing riches by another route: The right to collect land revenue. After Clive's arrival, the rich lands of the Coromandel Coast were contested between the French Governor General Joseph François Dupleix and the British. This rivalry included the British and French supporting various factions as Nawab of the remaining parts of the Mughal Empire. Clive was the first of the "soldier-politicals" (as they came to be called) who helped the British gain ascendancy in India. While the British would later be challenged in the South by Tipu Sultan of Mysore, Clive's fame and notoriety principally lie in his military conquest of the province of Bengal. At the age of eighteen, Clive was sent out to Madras (now Chennai) as a "factor" or "writer" in the civil service of the East India Company. The ship was detained in Brazil for nine months. This enabled him to learn Portuguese, which he often found of use later. At this time, the East India Company had a small settlement at Fort St. George near the village of Madraspatnam. On September 4, 1746, Madras was attacked by French Forces led by La Bourdonnais (this dispute was part of the War of the Austrian Succession) and after several days of bombardment the English forces surrendered and the French entered the city. It was originally planned that the town would be restored to the British after negotiation, but this was opposed by Dupleix, then the head of the French settlements in India. The prolonged negotiations led Clive and others to make their escape to Fort St. David, some twenty miles to the south. For his part in this, Clive was given an ensign's commission. The siege was eventually lifted when Mughal troops arrived to relieve the city. In the conflict, Clive's bravery had been noted by Major Stringer Lawrence, the commander of the British troops. However, peace of Aix-la-Chapelle, in 1748, forced him to return to civil duties for a short time. A bout of depression caused him to leave his duties for a short break in the Bengal area. The conflict between the British and the French continued, this time in political rather than military terms. When Clive returned the political scene had shifted and the powerful positions of Nawab of the Carnatic and Nizam of Hyderabad were both taken by rulers who were strongly sympathetic to the French cause. The Nawab of the Carnatic, Chanda Sahib (who came of the Nait community which had ruled the Carnatic under Aurangzeb) had been made Nawab of the Carnatic with Dupleix's assistance, while the British had taken up the cause of the previous incumbent, Mahommed Ali Wallajah. Dupleix was "rewarded with… territory said to yield an annual revenue of over 350,000 rupees." and in addition, he was made part of the Mughal hierarchy. In the conflict that followed, France and Britain remained officially at peace. The troops deployed were always those of the East India Company and the company could only rarely deploy more than a thousand troops. The British had been further weakened by the withdrawal of a large force under Admiral Boscawen, and by the return home, on leave, of Major Lawrence. But that officer had appointed Clive commissary for the supply of the troops with provisions, with the rank of captain. More than one disaster had taken place on a small scale, when Clive drew up a plan for dividing the enemy's forces, and offered to carry it out himself. In the summer of 1751, Chanda Sahib had left Arcot, the capital of the Carnatic, to attack Mahommed Ali Wallajah at Tiruchirapalli. Clive offered to attack Arcot in order to force Chanda Sahib to raise the siege. Madras and Fort St David could supply him with only 200 Europeans and 300 sepoys and of the eight officers who led them, four were civilians like Clive himself, and six had never been in action. In addition, the force only had three artillery pieces. The initial British assault took the fort at Arcot during a thunderstorm and Clive's troops immediately began to fortify the building against a siege. Aided by some of the population, Clive was able to make sallies against the besieging troops. As the days passed on, Chanda Sahib sent a large army led by his son, Raza Sahib, and his French supporters, who entered Arcot to besiege Clive in the fort. The little garrison had been greatly reduced by casualties. It now consisted of 120 Europeans and 200 sepoys. Only four officers were left, the stock of provisions was scanty, and the commander who had to conduct the defence under circumstances so discouraging was a young man of five and twenty, who had been bred as a book-keeper[…]But the devotion of the little band to its chief surpassed anything that is related of the Tenth Legion of Caesar, or the Old Guard of Napoleon[…] An attempt made by the governor of Madras to relieve the place had failed; but there was hope from another quarter. A body of six thousand Mahrattas, half soldiers, half robbers, under the command of a chief named Murari Rao had been hired to assist Mahommed Ali[…]Raja Sahib learned that the Mahrattas were in motion, and it was necessary for him to be expeditious[…]Rajah Sahib determined to storm the fort. The day was well suited to a bold military enterprise. It was the great Muslim festival, the Muharram, which is sacred to the memory of Husain, the son of Ali ibn Abi Talib[…]Clive had received secret intelligence of the design, had made his arrangements, and, exhausted by fatigue, had thrown himself on his bed. He was awakened by the alarm, and was instantly at his post. The enemy advanced, driving before them elephants whose foreheads were armed with iron plates. It was expected that the gates would yield to the shock of these living battering-rams. But the huge beasts no sooner felt the English musket balls than they turned round and rushed furiously away, trampling on the multitude which had urged them forward[…]After three desperate onsets, the besiegers retired behind the ditch. The struggle lasted about an hour; 400 of the assailants fell; the garrison lost only five or six men. The contemporary Tuzuk-e Walajahi states that Clive received assistance from two thousand Maratha horse (rather than the six thousand claimed by Macaulay) under the command of Madina Ali Khan and Yunus Khan, two sardars (commanders) of Mohammed Ali Walajah. This reinforcement proved a turning point and Clive with Major Lawrence were able to bring the campaign to a successful conclusion. In 1754, the first of the Carnatic treaties was made provisionally, between Thomas Saunders, the Company's resident at Madras, and M. Godeheu, the French commander, in which the English protegé, Mohammed Ali Khan Walajah, was virtually recognized as Nawab, and both nations agreed to equalize their possessions. When war again broke out in 1756, and the French, during Clive's absence in Bengal, obtained successes in the northern districts, his efforts helped to drive them from their settlements. The Treaty of Paris (1763) formally confirmed Mahommed Ali Khan as Nawab of the Carnatic. It was a result of this action and the increased British influence that in 1765 a firman (decree) from the Emperor of Delhi, recognizing the British possessions in southern India. His conduct during the siege made Clive famous back home in Europe. The Prime Minister Pitt the Elder described Clive as a "heaven-born general," endorsing the generous appreciation of his early commander, Major Lawrence. The Court of Directors of the East India Company voted him a sword worth £700, which he refused to receive unless Lawrence was similarly honored. He left Madras for home, after ten years' absence, early in 1753, but not before marrying Miss Margaret Maskelyne, the sister of his friend Nevil Maskelyne who was afterwards well-known as Astronomer Royal. In July 1755, Clive returned to India to act as deputy governor of Fort St. David, a small settlement south of Madras. However, on July 17, in his convoy of ships from England, returning to India for the East India Company, the lead ship, Dodington, wrecked at Port Elizabeth, losing a chest of gold coins belonging to Robert Clive, worth £33000. In 1998, 1400 coins were offered for sale, and in 2002, a portion was given to the South African government after legal negotiations. On his way back from leave, Clive (now promoted to Lieutenant-Colonel in the King's army) took part in the capture of the fortress of Gheriah (today Vijaydurg), a stronghold of the pirate Tuloji Angre. The action was led by Admiral James Watson and the English had a several ships available, some Royal troops, and some Maratha allies. The overwhelming strength of the joint British and Maratha forces ensured that the battle was won with few losses. A fleet surgeon, Edward Ives, noted that Clive refused to take any part of the treasure which was divided among the victorious forces (as was the custom at the time). Following this action Clive headed to his post at Fort St. David and it was there he received news of twin disasters for the English. Early in 1756, Siraj Ud Daulah had succeeded his grand father Alivardi Khan as Nawab of Bengal. In June, Clive received news, firstly that the new Nawab had attacked the English at Kasimbazar and shortly afterwards that on June 20, he had taken the fort at Calcutta. The losses to the East India Company due to the fall of Calcutta, were estimated by investors at £2,000,000. Those British who were captured were allegedly placed in a punishment cell which became infamous as the Black Hole of Calcutta and, in the stifling summer heat, the majority of the captives suffocated. While the Black Hole became infamous in Britain, it is debatable whether the Nawab was aware of the incident, or if it took place as described, since the account may very well have been embellished. By Christmas 1756, no response had been received to diplomatic letters to the Nawab and so Admiral Charles Watson and Clive were dispatched to attack the Nawab's army and remove him from Calcutta by force. Their first target was the fortress of Baj-Baj, which Clive approached by land while Admiral Watson bombarded it from the sea. The fortress was quickly taken with minimal British casualties. Shortly afterwards on January 2, 1757, Calcutta itself was taken with similar ease. Approximately a month later, on February 3, 1757, Clive encountered the army of the Nawab itself. For two days, the army marched past Clive's camp to take up a position east of Calcutta. Sir Eyre Coote, serving in the British forces, estimated the enemy's strength as 40,000 cavalry, 60,000 infantry, and thirty cannon. Even allowing for overestimation, this was considerably more than Clive's (approximately 2000 infantry, fourteen field guns, and no cavalry). The British forces attacked on February 5, 1757, and after an initial assault during which around one tenth of the British attackers were killed, the Nawab sought to make terms with Clive and surrendered control of Calcutta. In spite of his double defeat and the treaty which followed it, the Nawab soon resumed the war. As England and France were once more at war, Clive sent the fleet up the river against Chandernagore, while he besieged it by land. After consenting to the siege, the Nawab sought to assist the French, but in vain. The capture of their principal settlement in India, next to Pondicherry, which had fallen in the previous war, gave the combined forces prizes to the value of £140,000. Some officials of the Nawab's court formed a confederacy to depose him. Jafar Ali Khan (better known as Mir Jafar), the Nawab's commander-in-chief, led the conspirators. With Admiral Watson, Governor Drake, and Mr Watts, Clive made a treaty in which it was agreed to give the office of viceroy of Bengal, Bihar, and Orissa to Jafar, who was to pay a million sterling to the Company for its losses in Calcutta and the cost of its troops, half a million to the British inhabitants of Calcutta, £200,000 to the native inhabitants, and £70,000 to its Armenian merchants. Clive employed Umichand, a rich Bengali trader, as an agent between Mir Jafar and the British officials. Umichand threatened to betray it unless he was guaranteed, in the treaty itself, £300,000. To dupe him, a second fictitious treaty was shown to him with a clause to this effect. Admiral Watson refused to sign this. Clive deposed to the House of Commons that, "to the best of his remembrance, he gave the gentleman who carried it leave to sign his name upon it; his lordship never made any secret of it; he thinks it warrantable in such a case, and would do it again a hundred times; he had no interested motive in doing it, and did it with a design of disappointing the expectations of a rapacious man." It is nevertheless cited as an example of Clive's unscrupulousness. The whole hot season of 1757, was spent in these negotiations, until the middle of June, when Clive began his march from Chandernagore, the British in boats, and the sepoys along the right bank of the Hooghly River. That river above Calcutta is, during the rainy season, fed by the overflow of the Ganges to the north through three streams, which in the hot months are nearly dry. On the left bank of the Bhagirathi, the most westerly of these, 100 miles above Chandernagore, stands Murshidabad, the capital of the Mughal viceroys of Bengal. Some miles farther down is the field of Plassey, then an extensive grove of mango trees. On June 21, 1757, Clive arrived on the bank opposite Plassey, in the midst of that outburst of rain which ushers in the south-west monsoon of India. His whole army amounted to 1,100 Europeans and 2,100 sepoy troops, with 9 field-pieces. The Nawab had drawn up 18,000 horse, 50,000 foot, and 53 pieces of heavy ordinance, served by French artillerymen. For once in his career Clive hesitated, and called a council of sixteen officers to decide, as he put it, "whether in our present situation, without assistance, and on our own bottom, it would be prudent to attack the Nawab, or whether we should wait till joined by some country (i.e. Indian) power?" Clive himself headed the nine who voted for delay; Major (afterwards Sir) Eyre Coote led the seven who counseled immediate attack. But, either because his daring asserted itself, or because, also, of a letter that he received from Mir Jafar, as has been said, Clive was the first to change his mind and to communicate with Major Eyre Coote. One tradition, followed by Macaulay, represents him as spending an hour in thought under the shade of some trees, while he resolved the issues of what was to prove one of the decisive battles of the world. Another, turned into verse by Sir Alfred Lyall, pictures his resolution as the result of a dream. However that may be, he did well as a soldier to trust to the dash, and even rashness, that had gained Arcot and triumphed at Calcutta, and as a statesman, since retreat, or even delay, might have resulted in defeat. When, after heavy rain, the sun rose brightly on June 22, 1757, the 3,200 men and the 9 guns crossed the river and took possession of the grove and its tanks of water, while Clive established his head-quarters in a hunting lodge. On June 23, the engagement took place and lasted the whole day, during which remarkably little actual fighting took place. Except the 40 Frenchmen and the guns which they worked, the enemy did little to reply to the British cannonade which, with the 39th Regiment, scattered the host, inflicting on it a loss of 500 men. Clive restrained the ardor of Major Kilpatrick, for he trusted to Mir Jafar's abstinence, if not desertion to his ranks, and knew the importance of sparing his own small force. He was fully justified in his confidence in Mir Jafar's treachery to his master, for he led a large portion of the Nawab's army away from the battlefield, ensuring his defeat. Clive lost hardly any European troops; in all, 22 sepoys were killed and 50 wounded. It is curious in many ways that Clive is now best-remembered for this battle, which was essentially won by suborning the opposition rather than through fighting or brilliant military tactics. While it established British military supremacy in Bengal, it did not secure the East India Company's control over Upper India, as is sometimes claimed. That would come only seven years later in 1764, at the Battle of Buxar, where Sir Hector Munro defeated the combined forces of the Mughal Emperor and the Nawab of Oudh in a much more closely-fought encounter. Siraj Ud Daulah fled from the field on a camel, secured what wealth he could. However, he was captured by Mir Jafar's forces, and was later executed by the assassin Mohammadi Beg. Clive entered Murshidabad, and established Mir Jafar as Nawab, the price which had been agreed beforehand for his treachery. When taken through the treasury, amid a million and a half sterling's worth of rupees, gold and silver plate, jewels and rich goods, and besought to ask what he would, Clive took £160,000, a vast fortune for the day, while half a million was distributed among the army and navy (of the East India Company), both in addition to gifts of £24,000 to each member of the Company's committee (worth several million Pound sterlings now), and besides the public compensation stipulated for in the treaty. In this extraction of wealth Clive followed a usage fully recognized by the Company, although the fruitful source of future evils which he himself was again sent out to correct. The Company itself acquired a revenue of £100,000 a year, and a contribution towards its losses and military expenditure of a million and a half sterling. Mir Jafar further discharged his debt to Clive by afterwards presenting him with the quit-rent of the Company's lands in and around Calcutta, amounting to an annuity of £27,000 for life, and leaving him by will the sum of £70,000, which Clive devoted to the army. While busy with the civil administration (of which more anon), Clive continued to follow up his military success. He sent Major Coote in pursuit of the French almost as far as Benares. He dispatched Colonel Forde to Vizagapatam and the northern districts of Madras, where that officer gained the battle of Condore, pronounced by Broome "one of the most brilliant actions on military record." He came into direct contact, for the first time, with the Great Mughal himself, an event which resulted in the most important consequences during the third period of his career. Shah Alam, when shahzada, or heir-apparent, quarreled with his father Alamgir II, the emperor, and united with the viceroys of Oudh and Allahabad for the conquest of Bengal. He advanced as far as Patna, which he besieged with 40,000 men. Mir Jafar, in terror, sent his son to its relief, and implored the aid of Clive. Major Caillaud defeated the prince's army and dispersed it. Finally, at this period, Clive repelled the aggression of the Dutch, and avenged the massacre of Amboyna, on that occasion when he wrote his famous letter, "Dear Forde, fight them immediately; I will send you the order of council to-morrow." Meanwhile Clive improved the organization and drill of the sepoy army, after a European model, and enlisted into it many Muslims from upper India. He refortified Calcutta. In 1760, after four years of hard labor, his health gave way and he returned to England. "It appeared," wrote a contemporary on the spot, "as if the soul was departing from the Government of Bengal." He had been formally made Governor of Bengal by the Court of Directors at a time when his nominal superiors in Madras sought to recall him to their help there. But he had discerned the importance of the province even during his first visit to its rich delta, mighty rivers and teeming population. Clive selected some able subordinates, notably young Warren Hastings, destined to be his successor, who, a year after Plassey, was made Resident at the Nawab's court. The long-term outcome of Plassey was to place a very heavy revenue burden upon Bengal, as the Company sought to extract the maximum revenue possible from the peasantry to fund military campaigns, and corruption was widespread amongst its officials, whilst Mir Jafar was also compelled to extortions on a vast scale in order to replenish his treasury, which had been emptied by the Company's demand for an indemnity of 2.8 crores of rupees (£3 million). In 1760, the 35 year old Clive returned to England with a fortune of at least £300,000 and the quit-rent of £27,000 a year. He financially supported his parents and sisters, while also providing Major Lawrence, the commanding officer who had early encouraged his military genius, with a stipend of £500 a year. In the five years of his conquests and administration in Bengal, the young man had crowded together a succession of exploits which led Lord Macaulay, in what that historian termed his "flashy" essay on the subject, to compare him to Napoleon Bonaparte, declaring that "[Clive] gave peace, security, prosperity, and such liberty as the case allowed of to millions of Indians, who had for centuries been the prey of oppression, while Napoleon's career of conquest was inspired only by personal ambition, and the absolutism he established vanished with his fall," a passage repeated in the 1911 Encyclopædia Britannica. Macaulay's ringing endorsement of Clive seems more controversial today, as some would argue that his own ambition and desire for personal gain set the tone for the administration of Bengal until the Permanent Settlement 30 years later. The immediate consequence of Clive's victory at Plassey was an increase in the revenue demand on Bengal by at least 20 percent, much of which was appropriated by Zamindars and corrupt Company Officials, which led to considerable hardship for the rural population, particularly during the famine of 1770. During the three years that Clive remained in England, he sought a political position, chiefly that he might influence the course of events in India, which he had left full of promise. He had been well received at court, had been made Baron Clive of Plassey, if in the peerage of Ireland, had bought estates, and had got not only himself, but his friends returned to the House of Commons, after the fashion of the time. Then it was that Clive set himself to reform the home system of the East India Company, and began a bitter warfare with Mr Sullivan, chairman of the Court of Directors, whom in the end, he defeated. In this he was aided by the news of reverses in Bengal. Mir Jafar had finally rebelled over certain payments to English officials, and in consequence Vansittart, Clive's successor, had put Kasim Ali Khan, the Mir Jafar's son-in-law upon the musnud (throne). After a brief tenure, Kasim Ali had fled, ordering Walter Reinhardt (known to the Muslims as Sumru), a Swiss mercenary of his, to butcher the garrison of 150 English at Patna, and had disappeared under the protection of his brother, the Viceroy of Oudh. The whole Company's service, Civil and Military, had become mired in corruption, demoralized by gifts and by the monopoly of the inland as well as export trade, to such an extent that the natives were pauperized, and the Company was plundered of the revenues which Clive had acquired for them. For this Clive himself must bear much responsibility, as he had set a very poor example during his tenure as Governor. Nevertheless, the Court of proprietors, (who elected the Directors), forced them, in spite of Sullivan, to hurry out Lord Clive to Bengal with the double powers of Governor and Commander-in-Chief. On May 3, 1765, he landed at Calcutta to learn that Mir Jafar had died, leaving him personally £70,000, and had been succeeded by his son, though not before the government had been further demoralized by taking £100,000 as a gift from the new Nawab; while Kasim Ali had induced not only the viceroy of Oudh, but the emperor of Delhi himself, to invade Bihar. At this point a mutiny in the Bengal army occurred, which was a grim precursor of events a hundred years later, but on this occasion it was quickly suppressed by blowing the sepoy ringleader from a gun. Major Munro, "the Napier of those times," scattered the united armies on the hard-fought field of Buxar. The emperor, Shah Alam II, detached himself from the league, while the Oudh viceroy threw himself on the mercy of the British. Clive had now an opportunity of repeating in Hindustan, or Upper India, what he had accomplished in Bengal. He might have secured what is now called Uttar Pradesh, and have rendered unnecessary the campaigns of Wellesley and Lake. But he believed he had other work in the exploitation of the revenues and resources of rich Bengal itself, making it a base from which British India would afterwards steadily and proportionally grow. Hence he returned to the Oudh viceroy all his territory save the provinces of Allahabad and Kora, which he made over to the weak emperor. But from that Emperor he secured the most important document in the whole of British history in India up to that time, which appears in the records as "firmaund from the King Shah Aalum, granting the dewany of Bengal, Behar and Orissa to the Company 1765." The date was August 12, 1765, the place Benares, the throne an English dining-table covered with embroidered cloth and surmounted by a chair in Clive's tent. It is all pictured by a Muslim contemporary, who indignantly exclaims that so great a "transaction was done and finished in less time than would have been taken up in the sale of a jackass." By this deed the Company became the real sovereign rulers of thirty millions of people, yielding a revenue of four millions sterling. We are sensible that, since the acquisition of the dewany, the power formerly belonging to the soubah of those provinces is totally, in fact, vested in the East India Company. Nothing remains to him but the name and shadow of authority. This name, however, this shadow, it is indispensably necessary we should seem to venerate. Having thus founded the Empire of British India, Clive also ought to have put in place a strong administration. Whilst the salaries of civil servants were increased, the acceptance of gifts from Indians supposedly forbidden, and Clive exacted covenants under which participation in the inland trade was stopped, this had very little impact in reducing corruption, which remained as widespread as ever until the days of Warren Hastings. Clive's military reforms were more effective. He put down a mutiny of the English officers, who chose to resent the veto against receiving presents and the reduction of batta (extra pay) at a time when two Mahratta armies were marching on Bengal. His reorganization of the army, on the lines of that which he had begun after Plassey, and which was neglected during his second visit to England, subsequently attracted the admiration of Indian officers. He divided the whole into three brigades, so as to make each a complete force, in itself equal to any single native army that could be brought against it. He had not enough British artillerymen, however, and would not make the mistake of his successors, who trained Indians to work the guns, which were later turned against the British. Clive left India in February 1767. In 1769, he acquired the House and Gardens at Claremont near Esher and commissioned Lancelot "Capability" Brown to remodel the garden and rebuild the house. From 1772, he had to defend his actions against critics in Britain, who were numerous, vocal, and rightly suspicious of his vast wealth. Despite his vindication in Parliament, on November 22, 1774, he committed suicide by stabbing himself with a pen-knife, at his Berkeley Square home in London. His suicide has been understood in relation to the history of depression in his life as well as his addiction to opium. But the likely immediate impetus was excruciating pain resulting from illness which Clive attempted to abate with opium. Clive was awarded the title Baron of Plassey and bought lands in County Limerick and County Clare, Ireland. He named part of his lands near Limerick City, Plassey. Following Irish independence, these lands became state property. In the 1970s, a technical college, which later became University of Limerick, was built at Plassey. 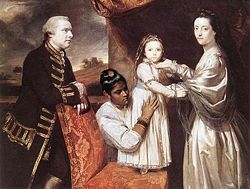 "Robert Clive and his family with an Indian maid," painted by Joshua Reynolds, 1765. Rebecca Clive (bapt October 10, 1760, Moreton Say, married Lt-Gen John Robinson, MP (d. 1798) in 1780, and died December 1795). 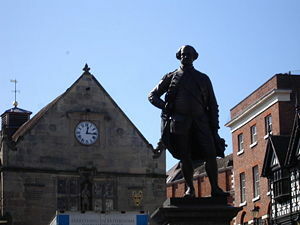 Robert Clive (August 14, 1769 - July 28, 1833), Lt-Col.
A statue of Clive stands in the main Square in the market town of Shrewsbury. Clive is a Senior Girls house at the Duke of York's Royal Military School, where, like Welbeck college all houses are named after prominent military figures. Clive Road, in West Dulwich, London commemorates Baron Clive of Plassey despite being so named close to a century after his death. Following the completion of the relocation of The Crystal Palace from Hyde Park to what is now Upper Norwood in 1854, the West End of London and Crystal Palace Railway was opened on June 10, 1854, to cope with crowds visiting the Crystal Palace. This led to huge increase in employment in the area and a subsequent increase in the building of residential properties. Many of the new roads were named after eminent figures in Britain's imperial history, such as Robert Clive. Clive's legacy was almost 200 years of British rule in India. During this period, India and Britain developed cultural links that have survived the end of colonial rule. English remains a significant language in India, which has assisted Indians' ability to enter and to compete internationally in the ICT field (information and communication technology}. Infrastructure, such as railway and roads and administrative systems developed by the British have remained in place in post-independence India. ↑ Jon Keay, The Honourable Company—A History of the English East India Company (London: HarperCollins, 1991, ISBN 0-00-217515-0), p. 289. ↑ Thomas Babbington Macaulay, "Lord Clive," Essays (London, 1891), p. 511-13. ↑ Burhan ibn Hasan, Tuzak-i-Walajahi (Madras, 1934), p. xii. ↑ Dodington Family, Ship-Notes. Retrieved July 17, 2007. ↑ John Keay, The Honourable Company—A History of the English East India Company (London: HarperCollins, 1991, ISBN 0-00-217515-0), p. 269. ↑ H.E. Busteed, Echoes from Old Calcutta (Calcutta, 1908), p.30-56. ↑ P.J. Marshall, Bengal: The British Bridgehead (Cambridge, 1988), p. 78-83. ↑ Marshall, Bengal, p. 144. ↑ Encyclopedia Britannica, Baron Robert Clive. Retrieved July 17, 2007. ↑ W. Darby, Dulwich: A Place in History (William Darby: Dulwich, 1967). Bence-Jones, Mark. Clive of India. New York: St. Martin's Press, 1975. Burhan, Ibn Hasan. Tuzak-I-Walajahi. Madras: University of Madras, 1934. Busteed, H.E. Echoes from Old Calcutta. New York: Barnes & Noble, 1972. Davies, A Mervyn. Clive of Plassey. New York: C. Scribner's Sons, 1939. Edwardes, Michael. 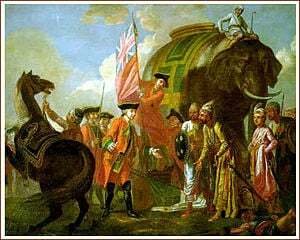 The Battle of Plassey and the Conquest of Bengal. London: Batsford, 1963. Macaulay, Thomas Babington. "Lord Clive." Essays. London: Longman's, Green & Co. 1891. p. 502-547. Marshall, P.J. Bengal, The British Bridgehead: Eastern India 1740-1828. Cambridge: Cambridge University Pres, 1988. ISBN 9780521253307. Olmert, Michael. 2001. "Features—With Clive in India—In Adding the Jewel of India to the British Crown, England's 'Heaven-Born General' Garnered Fame, Fortune—And Foes." Smithsonian. 31(11): 122. Watney, John Basil. Clive of India. Farnborough, Hants: Saxon House, 1974. ISBN 9780347000086. History of "Robert Clive, 1st Baron Clive"
This page was last modified on 22 June 2008, at 19:15.